If you’re in a hunt for the discounts for Namecheap, here’s a list of 100% working Namecheap coupon codes you can use to save more on hosting and domain registration. Hands down, Namecheap is one of the most popular companies when it comes to domain name registration and hosting. Although there are a ton of companies that offer both hosting and domain registration but Namecheap sets itself apart by offering their services at really affordable prices. So in this post, we’ll talk about some of the essential things you need to know about Namecheap along with pricing, features along with the Namecheap coupon codes for 2019 that you can use to save more money on their hosting or domain name registration. Are you ready to find out the 100% working Namecheap voucher codes and discounts for 2019? Let’s jump into the details. Do you want to get the best Namecheap coupon codes for domains in 2019? The great thing about Namecheap is it offers promo codes every single month. So if you’re looking for discounted prices on domain and transfers for the current month i.e March, 2019, here’s it. That means, you’ll be saving on every major type of TLD such as .com, .net, .info, .org etc when you use the coupon code from Namecheap. Want to get a flat 25% discount on Namecheap hosting? Namecheap is always known for extremely affordable hosting plans as they also provide better security and website speed. If you want VPS hosting from Namecheap, this is the best time as you can save 25% flat discount using the Namecheap coupon code mentioned below. With the above Namecheap discount code, you’ll get an instant 25% discount for one month in the regular billing cycle on any VPS hosting package from Namecheap. Do you want to get a SSL certificate for free from Namecheap? Then you can grab this Namecheap code where you can get EssentialSSL for 35% off. You can grab EssentialSSL at only $18.88/yr instead of $29/yr! That means, you’re instantly saving 35% discount. Namecheap is providing private plan on the email hosting and offering you 25% instant discount during this month, so what are you waiting for? Go grab the deal now before it expires. 25% off all Private package purchases of our Private Email service with annual and biennial billing cycles. Quick note: This only valid for new purchases, not for existing customers. What’s the cost of it? There are a ton of new TLDs available for just $0.88 such as .website, .space, .pw, .press, .host, .us, .online with free WhoisGuard forever, and free private email for 2 months. There’s a special deal going on Namecheap EV SSL where you can get the green ‘secure’ symbol in the address bar next to your site. If you’re looking for huge discounts on artificial intelligent suited domains, Namecheap has few great deals for you. .ai is perfect for startups and Artificial Intelligence companies, and we have the best price around! In the March month, Namecheap is offering .io domains only at $29.88 per year which is extremely suitable for technology related sites and online portals. Are you looking for the cheapest shared hosting plans from Namecheap? We’ve a great news for you. This March, Namecheap is offering up to 50% discount on their shared hosting plans. What’s the cost of the shared hosting plans? Hands down, Namecheap is primarily known for domain name registration with millions of active customers worldwide and they also offer affordable pricing which makes it a perfect destination for people to buy domains from them. As you can see from the above pricing options, you’ll notice that Namecheap offers standard pricing plans which constant (that’s the good thing about buying domains from Namecheap) whereas other companies like GoDaddy often increase their prices every year. If you are wondering about the pricing plans from Namecheap hosting, here’s the detailed breakdown of it so you can decide whether it’s right for you or not. Let’s now discuss about their pricing options so you can better understand what options suit best for your business apart from various Namecheap coupon codes mentioned above. 1. Shared Hosting from Namecheap: Shared hosting is widely popular and gives you access to cheaper hosting plans starting from just $2.88 per month where you’ll also get ultimate hosting features such as unmetered bandwidth, 24/7 support, a free .website domain name, WhoisGuard subscription etc. 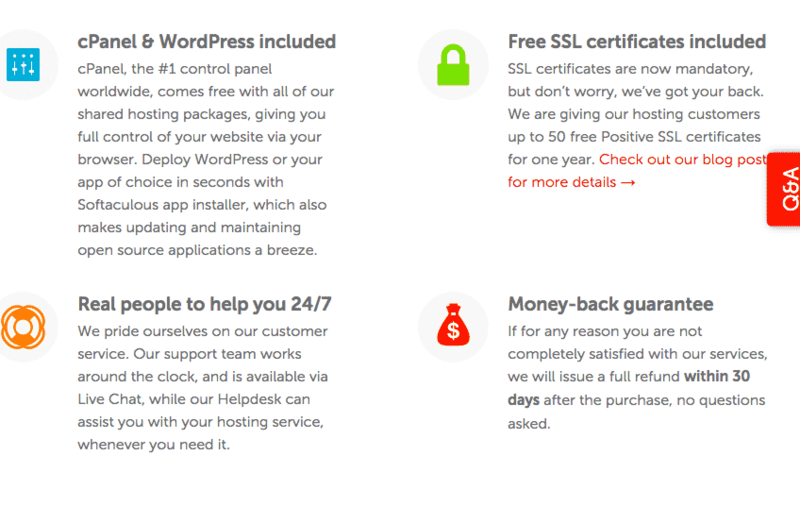 You can also get up to 50 Positive SSL certificates for a whole year to help get you started with Namecheap. Here are 3 pricing plans from Namecheap shared hosting. Let’s talk about each one of them now besides sharing Namecheap coupon codes for 2019. Stellar Plan: This is the basic shared hosting plan from Namecheap which costs you $2.88 per month and you’ll get access to the following things. As you can see from this plan, you can install 1 WordPress site with unmetered bandwidth and you’ll get access to 20 GB of disk space to run your site. Stellar Plus Plan: This is the widely used shared hosting plan from Namecheap which costs you $4.88 per month and you’ll get access to the following things. As you can see from this Stellar Plus plan, you can install multiple WordPress sites with unmetered bandwidth and you’ll get access to 50 GB of disk space to run your sites smoothly and this plan is suitable mostly for bloggers and affiliate marketers who run multiple sites at once. Stellar Business Plan: This is the advanced shared hosting plan from Namecheap which costs you $8.88 per month and you’ll get access to the following things. As you can see from this advanced plan, you can install any number of WordPress sites with unmetered bandwidth and you’ll get access to unlimited disk space to run your sites effortlessly. This is a great choice for those people who want more space, better performance and running heavy traffic websites. 2. WordPress Hosting: If you are interested to launch your site on WordPress, you should prefer managed WordPress hosting plan from Namecheap as it’s not only affordable but you can also set up a new site in under 30 seconds. You’ll also get automatic updates, easy back up options etc to control your site. 3. VPS Hosting: If you prefer to host your websites on SSD storage (which performs 10 times better than normal website servers) with superior performance and security, you should definitely go for VPS hosting where you also can grab a free .WEBSITE domain name is included with every VPS hosting plan. VPS Pulsar: Here’s the server configuration of VPS hosting from Namecheap Pulsar plan which costs you around $12 per month. 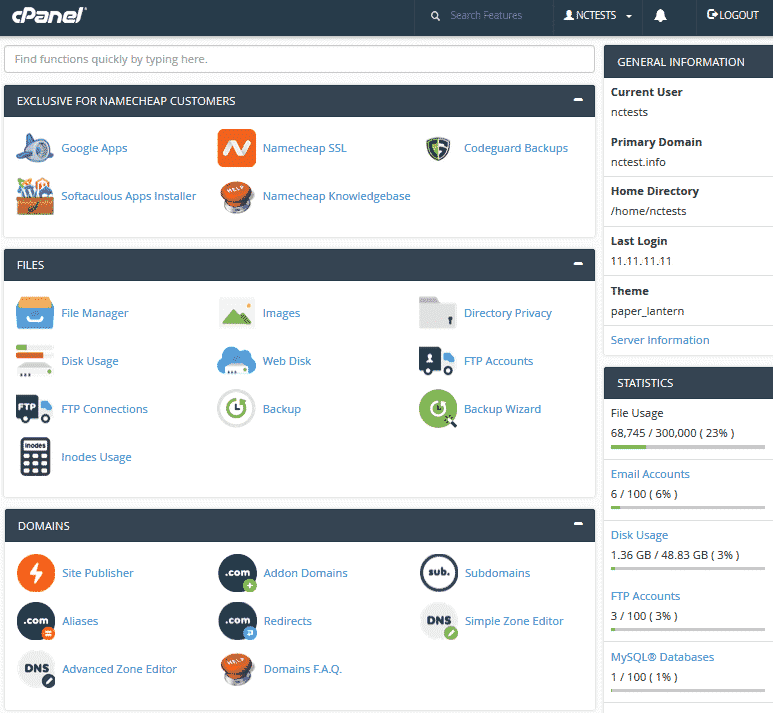 VPS Quasar: Here’s the server configuration of VPS hosting from Namecheap Quasar plan which costs you around $20 per month. 4. Dedicated Servers: The cost of dedicated servers hosting from Namecheap start from $58.88 per month to $379.88/month based on the server configuration you choose and most of the websites that use their dedicated servers have 100% uptime guarantee. 5. Reseller Hosting: The cost of reseller hosting from Namecheap start from as low as $16.95 per month to $46.95 per month based on disk space and bandwidth. Let’s now talk about some of the great features offered by Namecheap. If you are still not convinced about why you need to buy hosting or domain registration from Namecheap over other websites, here are few valid reasons to buy from them besides their exceptional Namecheap coupon codes for 2019. Namecheap is mostly known for domain name registration but it also offers exceptional hosting features at competitive prices. The best part about getting hosting from NameCheap is that, it offers you free hosting migration which means, you can move your site from your existing hosting (that you don’t like) to NameCheap at free of cost. Did you know that you can also get free access to Cloudflare (exclusive for Namecheap users). On average, a website that uses CloudFlare loads 30% faster and uses 60% less bandwidth. So if you’re looking for faster website loading times, this is a great feature for you. What’s the point of writing an article around Namecheap coupon code for 2019 without talking about their pros and cons. So let’s now talk about them. Recommended reading: Namecheap vs GoDaddy: Which One Stays On The Top? Here are some of the pros of using Namecheap. Here are some of the cons of using Namecheap. Here are few FAQs about Namecheap coupon codes for 2019 you need to know about so make sure to read them before giving a try to NameCheap. 1. How to apply Namecheap coupon code for 2019? Just click on this exclusive link and you’ll be redirected to Namecheap home page where you can either choose to register a domain or buy hosting and enter the promo codes that are mentioned in this post. The discount will be instantly applied so you can save more money while buying a domain or hosting from Namecheap. 2. Why should I buy from Namecheap although there are so many options out there? Yes, there are so many alternatives to Namecheap but it is one of the biggest platform for buying domain name with millions of customers and it has a great customer support which works 24/7. They also offer a ton of useful features such as free WhoisGuard, SSL certificates and so on just to make your domain name registration more safer. Another reason to choose Namecheap is that it offers affordable prices (along with the consistent rates every year unlike other companies like GoDaddy) which makes it a great choice for both domain registration and web hosting. 3. What if I need any help with my domain registration and maintenance with Namecheap? You’ll get support in various forms such as live chat, “submit ticket” system etc. You can also use their tutorials from knowledgebase to quickly find all the essential information related to managing your domains or hosting. 4. How can I connect my domain name from Namecheap to another hosting account? This is one of the most common questions as most people use Namecheap for buying domain names (as it is cheap and safe to buy from them) and often use hosting from other hosting companies such as WPX hosting, WPEngine, Bluehost and so on. Now, if you’re also one among them, all you need to do is to create a custom DNS from your Namecheap account and insert your hosting DNS nameservers. You’re done. It usually takes around a day or two to complete the DNS process successfully. 5. Does Namecheap also offer hosting apart from domain name registration? If you want to eliminate the paid of changing custom DNS (the step mentioned above), you can simply buy hosting along with the domain from Namecheap as it provides a wide range of hosting options for all kinds of bloggers, small businesses etc. Namecheap is currently offering various hosting options such as Shared Hosting, WordPress Hosting, Reseller Hosting, VPS Hosting, Dedicated Servers and Private Email Hosting – so you’ve a wide range of hosting plans to choose according to your budget and website needs. The great thing about using hosting from Namecheap is that, you can migrate to Namecheap for free, while most of the other hosting companies such as Bluehost charges hefty amount for website transfers. If you’re looking for an affordable and reliable platform to buy domain or hosting, Namecheap is definitely a great choice and they are growing at rapid pace. Namecheap is known for budget friendly domain registration and hosting plans and takes care of your website’s security which gives you access to 24/7 customer support just in case if you need any assistance. So what are you still waiting for? Go grab the Namecheap coupon codes for 2019 and start your blogging journey. Let us know what you think about Namecheap in the comments. Will this Name-cheap Promo Codes work in 2019? We are updating the promo codes into this post every month. Just check this post when ever you want to claim them and let us know in comments section if you face any issues in using the shared coupon codes. Thanks for the coupon codes for Namecheap. I taught I will miss the offer this year thankfully found your post. Is the discount coupons apply to all the hosting sites? Your screenshots gave me the crystal clear idea. Q & A is awesome. I never saw the post with Q & A your post is really great. Thanks a lot for writing. For the whole year, I would suggest keep coming to this post to find the hottest deals and discounts from Namecheap for products of your interest. But for this Black Friday & Cyber Monday, please bookmark this page https://bloggerspassion.com/namecheap-black-friday-cyber-monday-deals/. All of Namecheap Cyber Week deals will be updated in this post before that. This is really a nice a wonderful article on Namecheap Promo Codes 2018 but I just simply wanna know. Will this Namecheap Promo Codes work in 2019? Above promo codes will work for November month only. Namecheap offers new promos every month. No doubt some of these deals will be live in next month as well. But cannot give any assurance if all of these deals will be working in 2019 as well (its too far). We will keep updating this post with working promo codes for domain and other products every month. Thanks, Anil for giving me this promo code. I recently bought Namecheap hosting via your promo code and happy with this. I always read your blog posts as your posts inspire me a lot in my blogging. If you provide, We want to know your current Income from your blog just for inspiration. Hi Gautam, glad that the Namecheap promo code for 2018 worked well for you. I’d be really happy to share such working promo codes so you can save more whenever you purchase something from them. Glad to know that my posts are inspiring you. Thanks for sharing these coupon codes for Namecheap. It’s really a money saver to new users who want to start their online website or blog. Namecheap is really one of the best domain registrars and I am using them for my domain names registration. However, from past 1 year, I am using their web hosting and it is really great and works better than Bluehost. Support is also very prompt and helpful. I also recommend their hosting plans. Hi Vishwa, glad it helped you. Yes, these coupon codes for Namecheap help you save a lot of money especially for the beginners who’re looking to save more while buying hosting or domain or anything else. Yes, Namecheap is great for domain registration as few of my sites are hosted on them for a long time now.